Geckos are definitely a popular motif in Hawaiian culture, and appear on t-shirts, magnets, hats, and other souvenir items. While not as flashy as Elvis, geckos still have a broad appeal to both residents and visitors. For lizards, they're pretty cute, with rounded faces and feet. Baby gecko on an orchid. In local culture, geckos are considered good luck and are welcomed residents in a home. Geckos eat bugs, and bugs LOVE Hawaii. One would never deliberately kill or harm a gecko. Geckos belt out surprisingly deep and loud sounds for being such tiny critters. What is the sound of a gecko? It’s a bit hard to describe, kind of like the sound of one hand clapping. I’ve heard the sound referred to as clucking, chirping, barking, trilling, laughing, yelping, tweeting, bleating… Geckos seem to enjoy making these loud noises in the middle of the night. Geckos are unique among lizards for their chirping sounds. Geckos have amazing abilities to stick to things, like microscopic Velcro hooks on their feet. Scientists are studying the applications of gecko nano sticky pad technology. Some gecko species can reproduce by parthogenesis, meaning the females can reproduce without the males. Geckos lack eyelids and instead have a transparent membrane which they lick to keep clean! 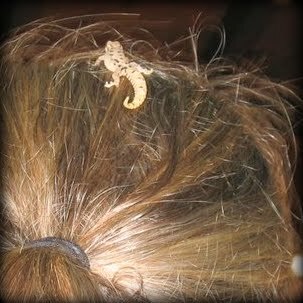 Geckos can fall in your hair when you're not paying attention. A house without a gecko is not a home. If you’re in any doubt, just ask a gecko. For every gecko we can see in our jungalow, there are probably at least 10 geckos that we can't see. Geckos are considered good luck, so I avoid using pesticides around the house which would upset the gecko ecology. Gecko exploring the beer bottle. Geckos Like to Drink Beer?! Yes, although some people are scared of them! My older brother was deployed to Hawaii when I was young, so my family and I went to Hawaii. I remember seeing some geckos in our hotel room. My sister freaked out, but I thought they were cute. "Then they can get in your hair," I remember her snapping. That's because their tails fall off at the slightest thing! ;) I grew up on Oahu, and they can be skittish, similar to cats. Yes, their tails can fall off. And they can also get severed in sliding doors which is quite disturbing. Now you know! It's pretty rare to see geckos in hotel rooms these days! They are well sprayed or treated for bugs, etc.